Jimmy Carter, and I say this in the most affectionate way possible, is just like our 15-year-old family dog Jack. They’re both Georgians beloved by their community. They’re objectively adorable. They hang out with our dad a lot. And although they are both getting up there in years, and have seen a few bumps in the road health-wise, they’re still with us, PTL. Both Jack and Jimmy Carter are defined by their persistence in the face of adversity. Jack, who weighs 10 pounds and six of it is fluff, will pull a full-sized adult human down the street to pick over some discarded food scraps. 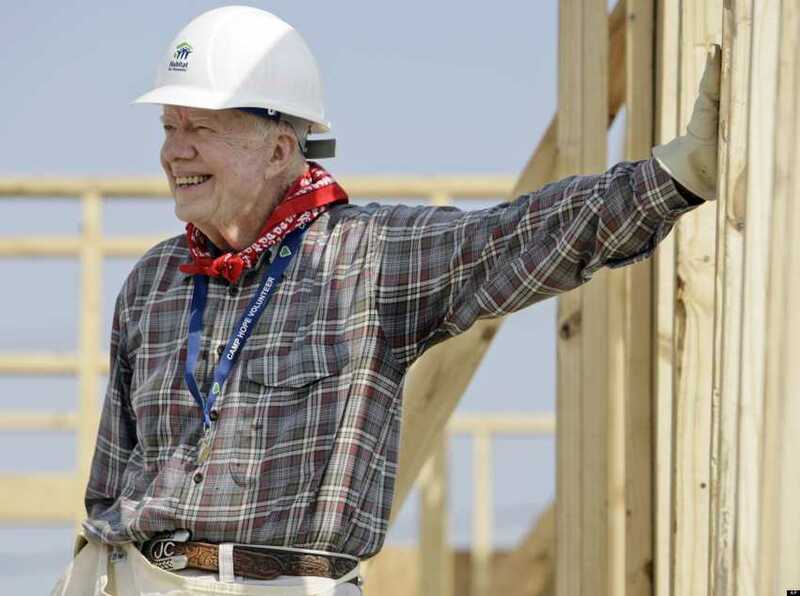 Jimmy Carter, after being hospitalized for dehydration while building homes Habitat for Humanity, went right back to working on the construction site. In all seriousness, Jimmy Carter is a resilient, servant-hearted, unbelievably optimistic American. And like a dog with a bone, that man loves Habitat for Humanity. If you give Jimmy Carter a hammer, he’s going to want to build. Perhaps it’s not surprising. The organization, which has built over 800,000 homes all over the globe, got its start in Americus, Georgia, in 1976, the same year that Jimmy Carter left his peanut farm in Plains, Georgia – one town over – to move into the White House. And the story of Habitat for Humanity is as fascinating (and as true) as the story of how Jack once ate an entire stick of butter off the dining room table before our very eyes. It began as the Koinonia farming community, founded in Americus, Georgia in 1942. Koinonia was a Christian commune with a socially radical creed for the time: blacks and whites lived together, in equality. They also aimed to conserve the earth’s natural resources and seek non-violence. They pooled their money and resources into a common account for all members to use. It was founded by two couples with fantastic names: Clarence and Florence Jordan, and Martin and Mabel England. They were deeply Christian, and as inspired by their faith as they were distressed by the racial tensions they saw all around them in the South. They weren’t just out in the boonies of rural Georgia, living off the land – well, they were doing that, but they were also enacting real change in the face of community opposition. For example, Clarence, who had graduated from UGA, served as a sponsor for two African American men seeking admission there in 1956, an effort that earned him praise from Martin Luther King, Jr. himself. Once the Supreme Court ruled in favor of desegregation in 1954, Koinonia became a target for violence. The farm was attacked by Klan members, lined up in a 70-car motorcade; shots were fired into homes; the produce stand was bombed. Neighbors boycotted the farm’s produce, and those who wouldn’t participate (even those who bought a simple bag of peanuts!) were violently attacked. By 1958, only a handful of members remained in Koinonia, down from 60+ a year before. They continued to attract people who believed in the cause, like Millard Fuller. Fuller gave away his business and his wealth to join Koinonia with his wife, Linda, in 1965. His eye for business helped the commune sustain itself financially as he developed the Koinonia Housing Partnership, a program that used volunteer labor to build simple houses for the poor as an act of charity and ministry. Families who moved into the homes would repay the cost of material to the Partnership at zero interest, so that more houses could be built. As the 1970s ushered in a new era of social liberalism, the Housing Partnership got more volunteers than it could handle and the commune grew dramatically. Fuller established the “Fund for Humanity” to take in donations. You can probably tell where this is going: they expanded this work to become the non-profit Habitat for Humanity International, and after just five years, they had branches in 14 states. By 1981, Habitat had recruited their most devoted volunteer: President Jimmy Carter. More than just peanuts, indeed! From a small town in rural Georgia rose an international force for peace and goodwill – twice. And with the way things are going now, we wouldn’t be surprised if Jimmy Carter continues building Habitat homes for the next several decades. Much like Jack will always be there to greet us when we get home. Because he’s going to live forever. Right? RIGHT?